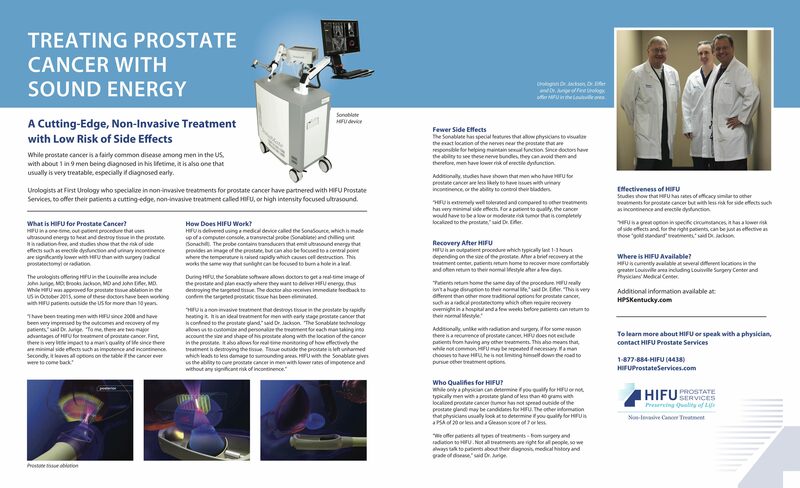 Urologists at First Urology who specialize in non-invasive treatments for prostate cancer have partnered with HIFU Prostate Services, to offer their patients a cutting-edge, non-invasive treatment called HIFU, or high intensity focused ultrasound. The urologists offering HIFU in the Louisville area include John Jurige, MD; Brooks Jackson, MD and John Eifler, MD. While HIFU was approved for prostate tissue ablation in the US in October 2015, some of these doctors have been working with HIFU patients outside the US for more than 10 years. Read the entire article by clicking here or on the image below.